Home > Blog > Does Marriage Really Matter? Marriage matters! That’s why from February 7th to 14th every year many organizations campaign to strengthen individual marriages, reduce the divorce rate, and build a stronger marriage culture. This in turn helps decrease poverty and it benefits children. The reason many organizations work together in this effort is to make a greater impact as a group rather than each one working alone. You may find that special events, classes, or groups are meeting in your area. Why the emphasis on strengthening marriage? As simplistic as it may seem it has been found that marriage works! Studies have shown that it makes people happier, live longer, and helps build more economic security. Familyscholars.org summarized their findings on marriage with 30 conclusions on how a healthy marriage impacts Family, the Economy, Physical Health and Longevity, Mental Health and Emotional Well-being, Crime and Domestic Violence. I will be sharing some of these conclusions in future blogs. These studies verify the importance of what God told us in His Word. 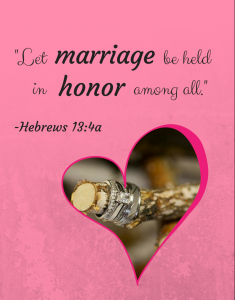 “Let marriage be held in honor among all,” Hebrews 13:4a. Not only is marriage a Divine institution but God’s desire is that we honor this institution. This is a good institution! I find it interesting that the author of Hebrews does not use the words “observed” by all. In other words not everyone has to marry. He says that marriage is to be held in honor among all! Whether you are married or single this is something that you can do! You can hold marriage in honor by what you say, do, and support! Honoring marriage really places it where it belongs for God instituted it for our benefit. In the beginning he saw that it was not good that man be alone and decided to make a helper suitable for him. It also connects it to Jesus who often used marriage and wedding analogies in his ministry as he defined his relationship to us and to His bride, the Church. Does marriage matter? Sure it does and that is why Lutheran Family Service wants do to what we can to help honor and preserve this institution through all of our ministries.